Do you wish your garage was clean, organized and used for more than miscellaneous storage? Many homeowners want to improve their current garage space. A majority of Americans spend a few hours each week in their garage engaging in activities but for many others, clutter and excess storage prevents them from using their garage to its full potential. D.B. Containers is the trusted dumpster rental service for New York City residents to organize and discard the clutter that's been stored in their garage for too long. We realize that cleaning and organizing even the smallest garages can be a huge undertaking which is why we've gathered a list of tips that will help you thoroughly clean and organize your garage while suggesting ways to keep your clutter to a minimum. When Is the Best Time to Clean and Organize Your Garage? Cleaning and organizing your garage is a significant job, whether you are completing this task as one part of a larger renovation for your home or as a separate project in itself. Depending on the size of the space, the items within and the goals you want to accomplish, you could spend more than a single afternoon decluttering, discarding and reorganizing your garage. When is the perfect time to clean and organize your garage? When the weather is consistent: Unless you have a patio with an awning, a four seasons room or a covered area to temporarily store your belongings, snow, rain and variable weather conditions can quickly interfere with your organization plans. 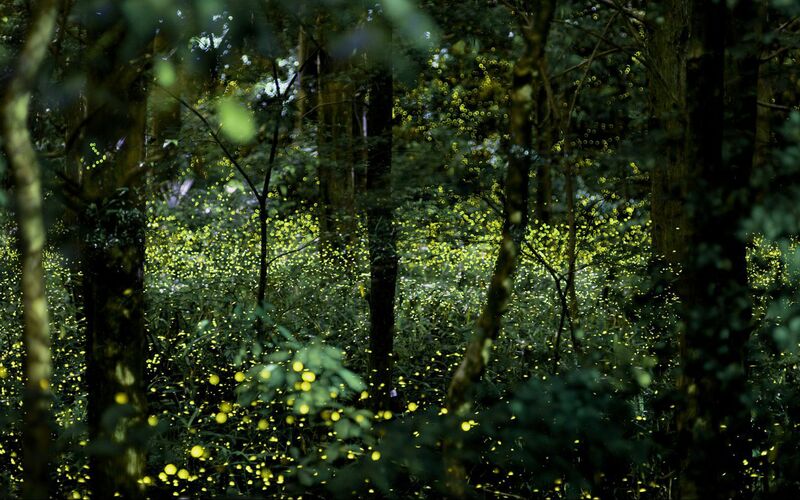 Of course, unpredictable weather can happen at any time but choosing a day in the late spring or early fall will allow you to use your lawn and driveway as you unpack and reorganize your garage. When you have the space available: If your garage or driveway is regularly used for parking, exercising, hobbies or any other activity, you'll need to choose a time that's convenient for everyone in your family who uses the garage. Even if you plan on working in small sections, make sure that you have the space available to work safely and efficiently. When you can dedicate the time to finish the job correctly: Cleaning out excess storage or reorganizing your garage to increase space for activities or parking could take more time than you expect, especially if you have boxes and bins to sift through. Rushing any home project is never a good idea. Make sure you have ample time to clean out your garage, go through your possessions and reorganize the space so it's functional and safe for your family. Preplan before you unpack: Cleaning out your garage is not as easy as cleaning out your pantry. This undertaking could last the entire day, if not the full weekend, which means you need to prepare for this project by creating a plan. Block off enough time so you can complete the project the way you want. Draw out ideas for where you want your new storage to go and block off areas for any hobbies, activities or parking space you'll need. Designate piles for items: You could toss all of your items into "keep" or "do not keep" piles but we encourage you to consider adding in "donate" and "sell" piles. There are many items you can donate to families in need. Other items, like landscaping or lawn care equipment, could also be sold if they're in good condition. "Donate" and "sell" piles are great ways to help your neighbor and make a little extra money while you declutter your garage. Find an extra set of hands: This is one home project that you don't want to tackle alone. Enlist the help of your family and friends so they can help you stick to your plan and finish the job correctly. Don't purchase organizational tools too early: The thought of having all of the loose possessions in your garage neatly packed and stacked in clean bins and cabinets is exciting enough to make you run out and buy those new containers you've had your eye on. However, waiting until after you've cleaned out your garage is a smarter choice. When you finish, you'll know exactly how many bins you need and of which size and shape. Buying too many or too little beforehand could actually increase your clutter that's leftover. Consider having a garage sale: When you've got everything sorted into your four distinct piles, take a look at how much is in your "sell" pile. Items such as furniture, baby supplies, tools, recreational and lawn equipment are enough to host a garage sale. If you're reorganizing your garage as part of a whole-home cleaning project, your yard sale can include other pieces of clutter you aim to get rid of including clothes, toys, books and decor. Homeowners wondering how to organize a messy garage might feel overwhelmed at first — and for good reason. Many homeowners throughout the country believe that they have too much stuff in their homes that increases their stress but struggle with getting rid of the clutter. Use these three tips to help you identify the clutter in your home and dispose of it properly. Be realistic with your "keep" pile: Your "keep" pile can grow out of control if you let it. Look at every item in this group and ask yourself why you should keep it. If you use that item for a specific reason, for instance, to decorate your house for an annual holiday, then give it a home in your garage. However, if you've held onto a "just-in-case" item for several years without actually ever using it, now is the time to get rid of it. Don't let your emotions get the best of you: Not all clutter is functional clutter. Plenty of families have heirlooms or other objects passed down from family members that clutter up their homes. If these items don't bring you happiness or provide any use, consider giving them away. Many antiques and collectibles can be appraised and sold to owners who will not let them gather dust in a garage. Dispose of items properly: Your "do not keep" pile may be destined for destruction, but be wary about which items you throw in the trash. Old cans of paint, motor oil, electronics, lawn chemicals and other items commonly stored in the garage are illegal to toss in a dumpster or with your curbside trash. Go through each item in this pile and either research its proper disposal method or call the NYC Department of Sanitation for assistance. Now that you've gotten all of the clutter out of your garage, the next step is to find convenient places to put the remaining items without creating more clutter. Although the possibilities are endless for storing your possessions in functional and attractive ways, remember to follow the plan that you created before you cleaned out the space. You want to make sure your finished project affords you the room you need for storage plus any hobbies, activities or parking space your family requires. Use basic storage tools: Shelving is simple yet effective for storage. Whether you decide to use empty milk cartons, containers with lids or other bags and boxes, organizing your items across floor-to-ceiling shelving is a great way to find a home for all of your possessions in a place that is quick and convenient to access. Create dedicated sections: Put your plan into motion and section off the areas of your garage that you will use for storage. If you don't already have a storage order, create dedicated sections for each item category. For instance, block off a column of your shelving to store home goods. Place the boxes you use least, like holiday decorations, on the top shelves and put the items you need most, like spare light bulbs and air filters, on the bottom shelves. Make use of vertical space: Don't limit your storage options to shelving when there is plenty of extra space throughout the garage to work with. The areas of the ceiling that are not along the garage door's track are perfect spaces to hang sporting equipment like bicycles, kayaks and surfboards. You can also use all of your open wall space to store tools, lawn care equipment and miscellaneous supplies you might need at a moment's notice like nails and screws, tape and pencils, reusable shopping bags and travel items. Create your own storage solutions: You can literally think outside the box by storing your garage items in unique ways. PVC piping screwed into the walls makes for a convenient storage solution for items like brooms, shovels and rakes. Pegboards or wire racks can also be configured in several ways to safely and visibly contain items like tools and cleaning supplies. Don't feel like you need to fill every space: Remember that the primary goal is to cut down on clutter. It is acceptable if your shelving unit is not packed with storage. The extra space helps you keep all of your items visible and is available for additional storage that you may need in the future. Organizing your garage is one job — cleaning it is another. Adding your garage to your annual or biannual home to-do list is a smart move, but you don't have to wait for spring to roll around to give the space a thorough cleaning. In fact, taking an afternoon to deep-clean the garage is a great way to help you keep the space organized while preventing clutter from building. You'll never have a garage full of junk if you contain the mess before it multiplies. Clear out your garage as much as possible: Even though you may not intend to reorganize or get rid of any of your items, by removing everything stored in the space, you'll have room to thoroughly clean every corner and cranny. With an empty space to work, you can start by dusting shelving and fixtures from top to bottom with a damp cloth. After you dust, vacuum and wash the floor, making sure to get all dust and debris from the edges and corners. Clean and return each item: Dust the outside of containers like bins and boxes or consider wiping them with a damp cloth to remove any dirt or mold. Clean off your lawn care equipment as well so you're not bringing grass clippings, mud or insects back into your clean garage. When you're cleaning, consider how many of these items you use, need or wish to keep. Discard what you don't use: Tools, landscaping equipment and holiday decorations are good to have on hand even if you only use them a few times throughout the year. However, other items like sporting equipment, furniture and duplicate appliances may be collecting dust and taking up space. If you have an extra fridge that is typically empty, an old couch trapped beneath a stack of boxes or a kayak that never touches water, take this opportunity to toss it and reorganize what you need to keep. Whether you're simply removing excess clutter from your garage or helping your in-laws turn their garage into a climate-controlled den with a complete renovation, a dumpster is a valuable resource you can't do without. NYC Department of Sanitation won't accept many large items during their weekly pickup and transporting your bulk of garbage will cost you time and energy that will unnecessarily extend your project's completion. Instead of adding this hassle to your to-do list, consider renting a dumpster as a convenient and affordable solution. Unsure of which size dumpster is ideal for your garage project? 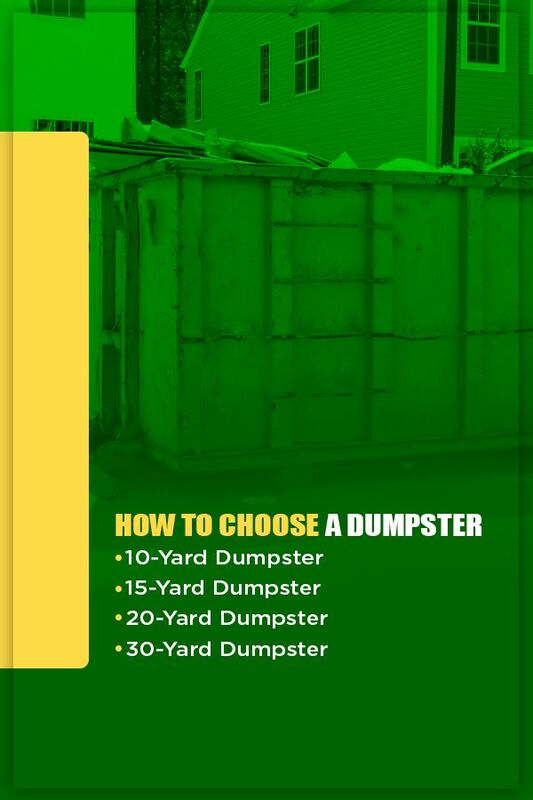 Consider these four dumpster options available from D.B. Containers to help you determine which size would be best for your garage clean out, decluttering or renovation. Keep in mind that hazardous materials such as household trash, propane tanks and paint cannot legally be placed in the dumpster, so do not account for these items when estimating how much dumpster space you will need. Do you have a single or two car garage full of clutter that is destined for the dump? A 10-yard dumpster is a perfect size. At 8 feet wide by 12 feet long, this size dumpster will easily accommodate the boxes, knickknacks and other small to medium sized items you wish to discard. Its 4-foot height makes it easy for people of all ages to effortlessly toss the garage contents over the lip of the dumpster. A step up from the 10-yard dumpster, the 15-yard dumpster is ideal for those who have larger garages packed corner to corner with everything your home can do without. Although it has an extended length, its height only measures 3.5 feet. This lower height is convenient for loading furniture and appliances into the dumpster while its extended length ensures that these bulky items are not taking up too much space. It will also accommodate debris from small renovations such as converting a garage into an additional living space. Although your home's garage may be organized, there may come a time where you need to help a family member clean out theirs. Whether you're assisting your parents as they downsize or if you're helping a relative with their estate sale, a 20-yard dumpster will afford you the space needed to remove anything and everything from the garage and additional spaces. Furniture, appliances and clutter of all shapes and sizes can be loaded and whisked away in a single trip with a 20-yard dumpster. Let's face it — the garage isn't the only area of your home that you have big plans for. If you've decided to knock out a few other home improvement projects as you complete your garage deep clean, a 30-yard dumpster will provide you with all of the room you need for construction material and debris alongside all of the furniture, appliances and trash that stacks up during these extensive projects. D.B. Container Service has helped customers throughout the boroughs of New York City reclaim their garages by providing them with quality, reliable dumpster rentals since 2001. We know that your discard pile can quickly grow with appliances, furniture, boxes and other items you no longer need. Instead of worrying how you're going to haul these items off to the dump, let D.B. Containers take care of your clutter for you. We'll help you secure the perfect size dumpster as you clean out your garage. Let us help you free up space in your garage for hobbies, activities or simply to maximize room for two cars to park. Speak with a team member today to learn more about which of our dumpster options will meet your needs. Our professional staff will give you honest advice and help you choose an affordable solution. Contact us today to request a quote from D.B. 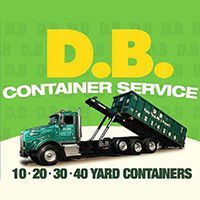 Container Service — the dumpster rental service that homeowners throughout Brooklyn, Manhattan, Queens, Staten Island and the Bronx have trusted for years.